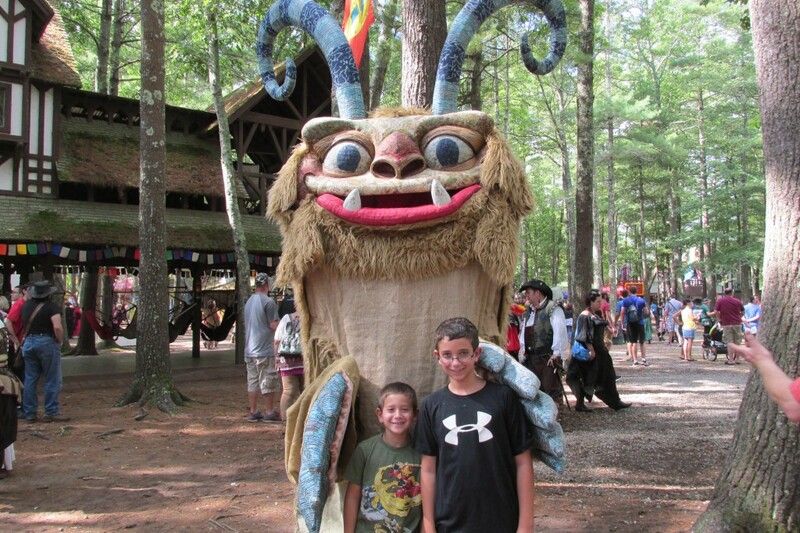 Last year, Chris and I took the gruesome twosome to King Richard’s Faire, our local Renaissance fair, which is open every September and October in Carver, MA. The boys loved King Richard’s Faire so much that we promised it was something we would do with them every year. Seriously, they have talked about it off and on all year long (you can read all about our day there last year by clicking here) and they were thrilled when we went back over Labor Day weekend. The fair includes all sorts of entertainment, exciting rides, shows, games and so much more on the 80-acre site of King Richard’s Faire. As soon as you walk through the gate, you feel like you’re stepping into medieval times. One of the things that my boys loved last year was this maze. It’s $2 per person to go through the maze and come down the slide, which I think it a little bit pricey since it only takes about 45 seconds to go through it, but hey – the boys love it, so who am I to say no. FYI, they did the maze three times. Each. One of the things our family loves the most about King Richard’s Faire is that there is entertainment all day long. There are nine stages located all throughout the fairground and shows go on all day long. Be sure to grab a schedule on your way into the fair so that way you will know what’s going on at which stage. We saw some awesome shows the day we were there. I mean awesome. Jacques Ze Whippeur (Dashing Danger) who amazed the audience with his skills using a whip. For the finale of the show, he was able to chop down a piece of spaghetti on top of his head using the whip. He kept whipping off pieces of the raw spaghetti until it was down to about 2 inches long…..on top of his head the entire time. Next we saw The Wonder Show featuring the magic of Joseph of Stoughton. It was the same show we saw last year, but it was so good that we were eager to see it again. It definitely did not disappoint. Next we saw the amazing Garbanzo do some fire Breathing and juggling. Before we left for the day, I wasn’t going to miss a chance to have a go at the throwing stars. Throwing stars are actually banned here in Massachusetts and the fair has to get a special permit to have them there. It’s definitely not as easy to use them as it looks, but for $3, it was worth a try. We had such a fun day at King Richard’s Faire. My boys have been talking about it non-stop since we went. Tickets are $29 adults, $16 children (4-11), children under three are free. Tickets may be purchased at the gate (cash only) or online in advance on the Faire’s website, www.kingrichardsfaire.net (FYI – there is a $2 fee per ticket for online ticket sales). The Faire address is 235 Main Street, Carver, Mass. 02330, phone is 508-866-5391. Parking is free and no pets or outside food/drinks permitted. The faire is open weekends now through October 19th from 10:30-6 pm! I love a Ren Fest. We have ours in the Spring, when it’s mild here. I totally get why ya’lls is open in the fall! Lindsey- Maybe we should take the kids this year! M and Peanut would love it! I haven’t been there in years. I remember it being a major rip off when I went, so I stopped going. We paid something like $20 each to get in and that was just for the privilege if walking in the door…..then they nickeled and dimed us for the whole time we were there. We go to a festival like this early. It always comes around for my birthday. Looks like you all had a great day. Oh I’m so jealous! We have wanted to go to a faire for a long time! They finally announced on in our state but it is a 10 hour drive away! Boo! lol. That’s so fun. I love the character in the 1st photo! Mica’s already asked to be a knight for next Halloween. That’s right he’s thinking about Halloween in 2015. I’ve never been to a renaissance fair, that looks like fun. Shhh don’t tell anyone but…My secret goal is to go to a place like Medieval Times. Ever since I watched that scene from the Cable Guy, I’ve been wanting to eat with my hands, and scarf down one of those giant drumsticks, while calling somebody “Wench!” Or is that what the guys are supposed to do? Looks like fun. I’ve been to a Renaissance fair once, but can’t really remember anything about it. This one looks really nice. This place looks so cool I would have a hay day there! I love when I get to see ppl do really cool stunts! That looks like so much fun. You took some great pictures too. Wow! Sounds like they have some great shows at the KR faire. I would love to see that guy with the whip – that sounds pretty amazing!! We love our local Renaissance Fair! I’ve gone every year since I was a kid. My parents even dress up and now my kids do. We go to the Renaissance Fair in Atlanta whenever we get a chance. It’s a really fun time for the whole family. I went there once with my sister about 10+ years ago. It was fun. Looks like fun. I wish we had something like that down here. I don’t know about the $2 for the a 45 second maze though. Love the pictures! There really is no faire quite like King Richard’s. It is such a tight knit community and I love the space they use year after year just dedicated to it. We are fans of the bow and arrows and the jousting. I stay so far from all this. I would have loved to bring my twins and enjoy the stuff. King Richard’s Faire looks AWESOME! I LOVE renaissanse faires! King Richard’s Faire looks like a great time. There’s so much to see and do there. Oh, this looks like a blast. I’d love to take my kids and just let them explore. Great! How fun! Renaissance faires are so cool. I love the theatrics of it all. King Richard’s Faire looks like a ye olde great time! I love things like this. They’re so much fun. I am very interested in going to King Richard’s Faire! I think it would be great for all my family! This looks like an absolute blast. I wish I loved close by so I could visit! I have been to the Renaissance Fair in Upstate NY a couple of times with friends. They used to go up dressed in period costumes–not me!! It really is an amazing experience! That looks like SO MUCH FUN!! Our kids would really get a kick out of going there. Looks like it’d be fun for the whole family! This looks like so much fun. It reminds me of the Renaissance Festival here and back where my parents live. We’ve never been to the one here! How fun! I’d love to take my daughter to King Richard’s Faire. She’d love it! I love the Renaissance fair as a child–but have not taken my daughter to one yet. Thanks for the reminder! You guys just never stop, do you? I think that our whole family would have a blast at- so much to see! Such a great time and the crowds dress better than the employees at here. And my annual turkey leg was delicious. I’m a huge fan of medieval places. This place looks like so much fun. This seriously looks like so much fun for our family. I cant wait to take them back up north. This Faire looks like so much fun! We have a Ren faire every year, and I am promising my family we are going this year! Looks like so much fun! We wanted to go, but it’s too far from the house for hubby to feel comfortable. He said he didn’t want me giving birth in medieval times. lol. I have never been to a Renaissance fair but it looks like much fun. I loved looking at the pics. Me and hubby have been to things like this before and they were fun! Love all the characters, so fun to walk around and experience everything. How fun we love these kids of fairs. We have a medieval fair every January and i can’t wait to go again this year. We have something like that here. It’s such a great family activity!! I would have loved to take my students there when I taught social studies. This sounds like such a fun family activity! What a great way to learn about history and have fun at the same time. Sounds like a fun day! I have always wanted to go to a Renaissance fair, but have not found one near enough. This looks like something my daughter would so enjoy! Looks like a really fun event! I love visiting Renaissance fairs. This looks like a lot of fun. I think it’s great that your kids get such great experiences with you. I am definitely try to go to the local faire! Ok, that spaghetti whipper is nuts. Your faire is way better than the one I went to a couple of years ago. One of the “acts” was this guy letting snotty spit drip down in a long line and then sucking it back up. I couldn’t make that up. Oh wow what a fun way to spend a day!!! I have never been to a fair like this but I totally would love it! Love all your pictures!!! Weve never made it to King Richards Fair. We are always saving for Disney. It sounds awesome! I have never heard of this but looks like SO much fun!! I love live magic shows! Looks fun! We haven’t been yet, but we hope to do it when the kids are a bit older. I love events like this one where you can role-play and pretend like you are living in another time. Sometimes it is nice to be able to escape reality for a little while. Sounds like fun, and a great family activity. We wanted to go to our local Ren. fair this year, but the only weekend we could make it was rainy. But we will go next year for sure. Looks like a fun place to go with the kids. I would love to see the guy chopping the spaghetti with the whip…..oh my goodness. Awe, that looks like so much fun, I’ve always wanted to go to a faire but we don’t have them here. Boo! I loved going to that sort of thing when I was younger. I have never taken my kids though. The fam and I are going in October. September is super busy on the weekends for us, but we certainly cannot wait to get to King Richards Faire. Glad you guys had fun! They have a renaissance fair here every year as well and my hubby and I were just talking about going next year last week! Looks like fun! This looks like great fun. I’d love to take the family to King Richard’s Faire. My kids would love it! What a fun way to spend Labor day weekend together! I love that they got to spend a fun weekend doing what they love!! What a fun place! Our kids would LOVE it!! We haven’t been to the ren fest in Kansas City in a while. Always a lot of fun to go. This place looks superb. I would really like to see the fire breathing place. Did I read right that his name is Garbanzo? Like the bean? I love those! I’ve always wanted to go to a medieval faire. This looks awesome! I think we’re going to have to make a trip up to Carver one of these weekends coming up! Ha! What an experience to try throwing those stars! The Jacques Ze Whippeur show sounds like it was a blast as I love how unique his skill is! This place looks magical and fun! Thanks for sharing! That looks likea lot of fun. I wish they did something like that where I live. That looks like a great place to take the family! I would love to go! Oh wow. That looks like so much fun. I bet y daughter would love it. We love going to our local Renn Faire here in Pa. The kids have a blast the shows are amazing, and hey we get to dress up! It’s a good time for everyone. Looks like a great time! My boys would love this! King Richard’s Faire looks like a hit with the kids and adults. It’s too far to drive this year, but is definitely on my Bucket List for next. We have Ren Fest here in AZ. Not as authentic because its in the desert. We have great permanent buildings as such so it still feels right. I love going! ! I went to my first Ren festival this year in Colorado and it was a lot of fun! We have one here in Pennsylvania. I’ve never been, but my kids went there on class trips and really enjoyed it. You know we never have gone but I’ve always wanted to take the boys. It really looks like so much fun! That looks like fun! We have a Renaissance fair once a year not too far from us – perhaps we’ll check it out this year! This place looks really fun! My kids and husband would love it!! This looks like so much fun. I will be looking up when the next Renaissance Fair will be in my area. I’ve always wanted to attend one of these renaissance fares. Looks like your boys enjoyed it. Looks like a really great time! I’ve never been to any place quite like this but it looks like it would be a lot of fun! I’ve never been to a Renaissance Faire but it looks like everyone had a great time. My kids always loved the Medieval section of Legoland! Sign me up! I totally would love this. What great fun! I’m sure it was right up the kiddos’ alley! I want to go to this place to get a big old turkey leg! Yummy in my tummy!! Looks so fun! Looks like you all had a fun day out. I love when the Renaissance Faire comes to Louisiana every year around my birthday. The Renaissance Fair comes near us every spring, near the end of school. It’s one of our favorite ways to get excited for summer. Medieval festivals are so much fun! It looks like you guys had such a great time. That looks like so much fun! I bet your family had a blast! That looks like a lot of fun! I’d love to be able to take the kids there someday. Renaissance fairs are so much fun. Sounds like everyone had a blast! Looks awesome! My kids love magic shows. Well they say there is no magic but nice tricks 🙂 either way looks like a fun time. I’ve never even heard of a Renaissance fair but it looks like it’s lots of fun!! Looks like a fun family friendly place to visit. My kids would love it. That looks like an interesting festival. Great photos! I’ve always wanted to go to one of these festivals, they look so fun! I’d love to dress up in the medieval style clothing too! Your kids look like they had the best time! I have always wanted to go to King Richard’s Faire! It looks like such a great time! That looks like so much fun! I’d love to visit somewhere like that for the kids! I have always wanted to go to something like this! When I was younger, I auditioned for a Ren fair. I didn’t make the cut, but it was still fun to meet all the people who were super amazing at it. Ahhhhh! This looks like so much fun! I have never been to anything like this before, but hopefully some day I will! That looks like so much fun! I love any kind of fair. Re: the throwing stars, I was hit in the head with one once when I was 6 years old, by a stupid little boy… awful. I’ve always been so curious about the medieval times. I wish there was something like this here in Montreal so that I could take the little man. I know the hubby would also enjoy it! Oh I love Ren Faires!!! This one looked amazing! These kinds of places are so fun!! It’s so different from the traditional parks. We had a StoryLand near us, but sadly it closed last year. Holy Fun Pants!! I’ve never been to a festival with this theme, but this looks like so much fun! This looks like so much fun! I wish we had one of these where I live. This looks like fun. They have one of these types of fairs every year here and I am always tempted to go check it out. There’s no way I’d be able to fix in that box. Ha! I love places like this! Wish I could come visit the one you went too but I should try to visit our local one. It may be the last year since a casino might be built on it’s spot. Boo!